The family business was founded in 1873 by William Haran & his younger brother John. Located in Crookston Street, Kingston, Glasgow the business served local companies and house factors in the south side of Glasgow. Williams sons John and William joined the company in 1900, the same year the business was further expanded by the addition of new technology – a Charter Lee motor cycle and side car which reduced the reliance on wheelbarrows to carry glass. In 1914 during the 1st World War William was called up for active duty. After serving three years in France he returned home on sick leave due to trench foot however was returned to the front line by the military police after he was found working for the business. During the 2nd World War the company was contracted to repair bomb damage in the Glasgow shipyards, however in 1940 William was arrested as a spy for sketching the glazed roof of the British Polar Engineering factory, thankfully he was released later that day when the factory manager explained the situation. John’s son Ian joined the business in 1955 after completing his national service with the RAF. He took over as Managing Director in 1965 and is still chairman to this present day. Harndec Flooring was founded in 1968 as an associated company to provide additional services to the existing customer base. In 1973 the business celebrated its centenary, having been expanded into one of the most prominent glazing contractors and glass merchants in the West of Scotland. Ian’s son and daughter, Fraser and Lindsay Haran joined the company in 1990, in 1992 Fraser launched Reglit Glass Architecture and formed Westcrowns Contracting Services in 1995 to centralise the management and administration activities of the group’s successful subcontractors Harndec Flooring Comapany and Reglit Glass Architecture. In 1999 current managing director William McBride joined Westcrowns Contracting Services adding a third division Lumaglass in 2006. 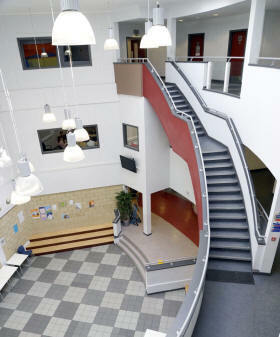 Since they were founded in 1968 Harndec Flooring Company rapidly became the largest privately owned commercial flooring contractor in Scotland. 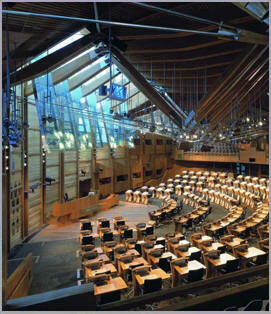 Their workforce is made up of directly employed tradesmen (as opposed to self-employed subcontracted men which other Scottish flooring contractors tend to rely upon) who are fully qualified, have undergone all relevant training, are CSCS approved and have been vetted under the Disclosure Scotland Act. 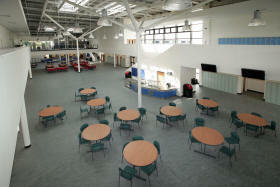 They have a huge portfolio of successful installations on notable projects across Scotland including larger scale hospital contracts such as Edinburgh Royal Infirmary, New Victoria Hospital, Southern General Neo Natal Unit, Rosshall Hospital and Forth Valley Acute Hospital, PPP school schemes across the regions; South Lanarkshire Schools, Highland Schools, Ayrshire Schools, East Dunbartonshire Schools etc, Prison projects; HMP Addiewell, HMP Castle Huntly, HMP Glenochil, HMYOI Polmont and HMP Edinburgh Saughton and installations within some prestigious buildings in Scotland such as; The New Scottish Parliament Building, Scotland’s National Stadium Hampden Park and Kelvingrove Art Galleries. 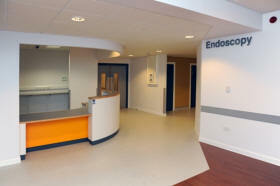 Reglit Glass Architecture is the exclusive distributor of the Pilkington Profilit™ Glass System in the UK and Ireland. The U-shape configuration of the glass produces a high structural strength within the channel allowing it to be installed at high level or in large units without the need for additional horizontal or vertical supports. This profiled glass has been produced in Germany for over 35 years and is now accepted as a standard building component for large-scale construction projects. 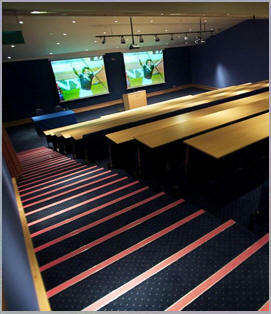 Reglit have installed the system on many high profile projects across the country including the Arsenal Emirates Stadium London, Manchester Enterprise Academy, Imperial College London, Suffolk New College, Hampden Park Glasgow, Manchester Concert Hall, Liverpool John Moores University, Lancefield Quay Glasgow, Bristol Airport and Westway Beacons London. 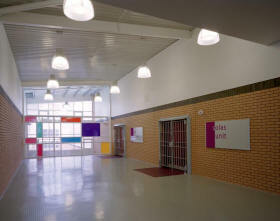 Lumaglass was created as a new division of Westcrowns Contracting Services Ltd in 2006 as a natural evolution for the existing profiled glass system. 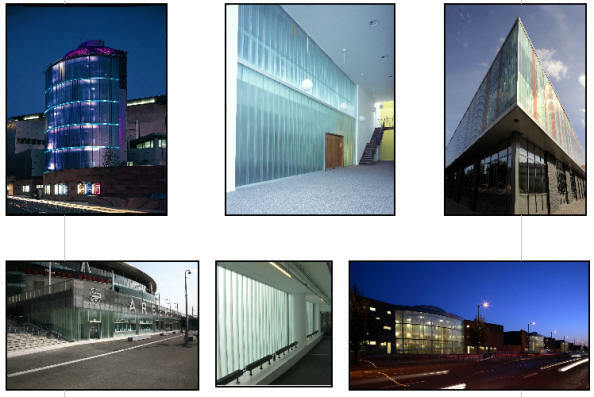 When combined with the patented electroluminescent lighting system the glazed screens can be installed externally to create buildings with character which will stand out in any surrounding or internally for creative focal points and stunning, original lighting features. 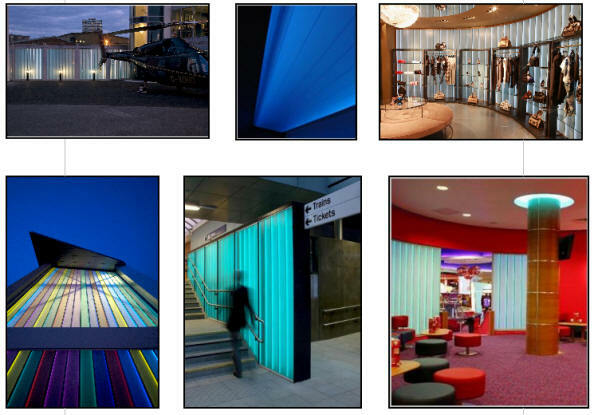 Since their launch Lumaglass have celebrated many successful and innovative installations from eye-catching interior fit outs like Hervia Bazaar in Manchester’s Spring Gardens, AMF Bowling High Wycombe and three new Vue Cinemas in Thanet, Stirling and Hull to bold exterior projects such as Battersea Heliport and Dartford Community Hub.